Ideal for a variety of uses in any kitchen, the spoonula is a truly versatile utensil. This 16'' spoonula features a high-heat, white silicone head that is heat-resistant up to 500 degrees Fahrenheit. Use this item to stir, or spread anything from sauces to batters! Its one-piece construction makes it one of the most sanitary kitchen items available, and its convenient hanging hole allows for quick access in the kitchen and easy storage! A durable red handle retains flexibility when you need it. this is a terrible product. Flimsy, and the end just kept falling off. Will never purchase this product again. We are happier with the name brand even though it is double the price. We appreciate your feedback, Laura! If you ever have any questions about the product you have purchased, contact our Customer Solutions team. Very Flimsy spatulas. They have 3 slots down the handle which causes them to not be ridged at all. The picture shows a solid handle not one with slots in it. Of course doing a return here is a major hassle. I did the online chat and she needed me to send her pics of what I got so they would know what they sent even though I gave her the item number that is printed on each one. I bought ones earlier from here and they were great but these are not worth the money unless you want a child toy. We appreciate your review, Merv! If you are looking for a different product that will better suit your needs, please contact our Customer Solutions team. Wanted a longer handle then the ten inch since I really like that one. This I will never buy again as it is very flimsy. Thank you for the review, Donald. We are sorry you do not prefer the flexibility of this spoonula. For a more heavy duty option, try this Vollrath 58126 16 3/8" High Temperature SoftSpoon Spoonula instead! Threw both of them that I bought in the trash. The long handle is great, but to flimsy to lift anything. Trying to get any type of filling or cream out of a bucket or bowl will not happen with this Spoonula, it just bends. Thank you for the review, Holli! We are sorry to hear that you did not like this spoonula. We recommend trying this Vollrath 58126 16 3/8" High Temperature Spoonula for a more durable option. I would not recommend this product to any large kitchen. The handle bends too easily and can not handle stirring any soups or sauces. Spend more money and get a better product. Thank you for reviewing this item! We are sorry you were not satisfied with the utensil you purchased recently. Our experts recommend this Vollrath High Temperature Spoonula as a more durable option. Great tool for cleaning out bowls. And allows for transferring of products while minimizing spills. Perfect amount of "flex" for scraping and scooping. Easy to clean as the heads come off. These are great, high quality, durable spoonula. I've never had the rubber break or crumble, and it can take the heat pretty well. Great product and a great price! A great spatula when cooking over gas heat in high heat conditions. I make a lot of sauces and gravy’s for my dishes and this allows me to get every last drop! These high temp spoonulas are to flimsy and bendy the handle needs to be stiffer. Wont be buying these again . Sounded like a good buy but didn't hold up and they bend in your hand. These were a total waste of money, and I ended up replacing all the from another vendor. You can't even use them, they bend so much. I was very disappointed in how they turned out. Thank you for the review! We’re sorry this is not working for what you need it for. We suggest trying this Vollrath 58126 16 3/8" High Temperature SoftSpoon Spoonula instead. Very flimsy. Spend the couple extra dollars and get a more sturdy one. I wouldn't recommend this product! You get what you pay for with this one. The length of this spatula is great but the handle is very weak and flimsy. It works well for sauces but its not strong enough for anything with consistency like baked beans or mashed potatoes. Disappointed that they were over a certain price. These are WAY too huge for the things we do in my sub shop. I thought maybe to get the last of the dressings out of the gallon jugs, but we just cut them open now. Love the Spatula though, good quality. The extra long handle on this spoonula makes stirring in the largest of containers possible. Super thick silicone head and strong handle makes this item a great choice. This is a very good deal. 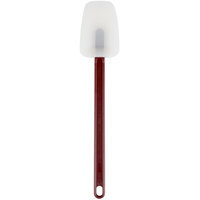 The spoonula is high quality, very inexpensive, and quite large and sturdy. It is a great choice for working with larger bowls. The handle on this spatula is a little longer than I need for most pots or tasks. However, I love using these high temperature spatulas. I find myself reaching for them instead of a wooden or stainless spoon more and more often. I was a little leery at first because of the price, but I'm a very happy customer! This product has far better quality then I expected. It is great with high temperatures. The spatula with a curve! these are great ways to clean around the edges and sides of any pot or pan. Insures total product removal, and they hold to the heat well. I love the longer handle on this spatula. It allows me to stir large pots of jams and sauces without worrying about burning myself. I will be ordering more. Nice and large spoonula. Great quality and outstanding price! You will enjoy every minute to work with this spoonula. Great for any household or restaurant. Love this spoonula and use it all the time with my 20 qt stainless steel mixing bowl. It is sturdy and great for not only mixing, but also scraping the sides of the bowl. I love that I can use it safely with hot foods too. This is a great spatula. We needed something to scoop the mayo out of the tall containers. It works great and the quality is awesome. These are nice and long and seem to scrape pretty well. They are about medium stiffness so they are ok for scraping cookie dough out of the bowl. I got this for stirring batches of cold brew coffee. At this length the handle is a little flexible, but overall I'm pleased with it. Absolutely love this spoonula. The high temp silicone head means you can use it with anything - really great value for the price, will last forever. Dang I love these things. Some chefs refer to silicone spatulas and spoontulas as "million dollar tools". We use this one to help mix ingredients in a 40 qt mixer. It works great to scrape the sides and bottom of the bowl to make sure our bread and cheesecake ingredients get mixed thoroughly. This spoonula is great! It's nice to have these on hand in a busy commercial kitchen. They hold up and clean easily. The long handle is even better. Overall great buy! The 16" version of this spoontula is great for any high volume production kitchen. These spoontulas allow you to scrape out bowls, and do some thorough mixing without having a floppy silicone paddle bend all over the place. Love how sturdy the handles are on these. While yes I've broken a few, it was only because of the product not the spoonula. Wish I had a whole various sized set at home! This sucker is HUGE! Okay so this is for residential not commercial use but I bought it thinking it would be nice when I make large bathes of cream soups, banana bread or cookies. The handle is lightweight which makes it difficult to use at this size and it bends and flexes when stirring soup. Also I have a 6 qt kitchenaid bowl and this thing can fit but it just seems to big for it, so I've only used it once for banana bread, and it worked fine to scrap but bowl but it's so big that I normally use the 14" one I also bought. I haven't used it for cookies since I don't like it in my kitchenaid but I bet it would be too weak anyways. Overall this product isn't very expensive and you can tell by the quality. It would probably work in limited applications but it just doesn't work for what I wanted it for. I guess I'll go with the vollrath one next time. This is a great high heat spatula! The long handle ensures that you don't get too close to what you're cooking and the curved shaped is great for scraping out all of the product! I like the shape of this spoonula, but the handle is very flexible. It is difficult to use with thicker batters and doughs. It definitely holds up to high temperatures though and is good for making caramels and other hot sauces. Sturdy, well made with just enough flex to handle a variety of viscosities. Unbeatable price for silicone and a 16 inch reach. Will be ordering more. The length is great but the handle is not as strong as it could be. It works well for soups and cheese sauces but its not strong enough for more solid cooking like baked beans. Thank you for your review! We're sorry to hear your spoonula was not strong enough for your applications. For a more sturdy spoonula, try this Mercer White High Temperature Spootensil. We have decided to invest in all high-temp spatulas. Since the staff doesn't always listen to their training, they tend to use low-temp spatulas for high-temp uses, thus ruining them. These are just a hair weak, compared to more expensive competitors, but are decent for the price. These are almost a staple in any restaurant. High heat resistant, durable, and come in a variety of sizes. We purchased several and will be getting more. Ten times better then just your average spatula. The spoon shaped head makes scraping out containers a breeze and is great for stirring large batches of sauce on the stove.